… are part of Huai Nam Dang National Park. The hot springs are 2 km off Route 1095 at Km. 87, the entrance fee for foreigners is THB 200. The springs have an average temperature of 80°C. Steam from the springs permeates the site in the morning creating fascinating sights. 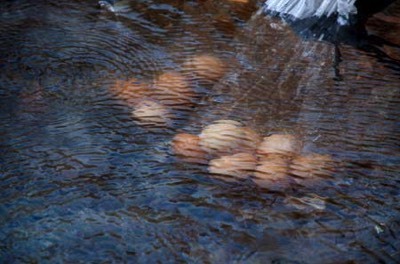 It is possible to boil eggs in the uppermost pools (which have been left in their natural state). Please read the signs, if you are boiling eggs; one of the pools feeds the houses of local villagers. The last thing they want is salmonella poisoning. Recently the stream has been contained in basins. As the stream flows through the basins; it becomes cooler, so that each basin has its own temperature. The area is also rich in teak wood and suitable for overnight camping. 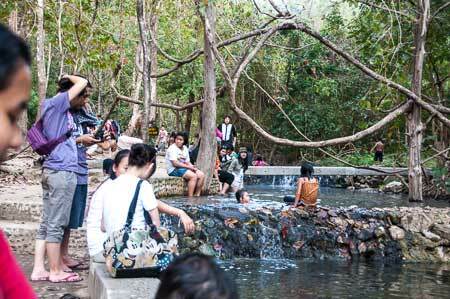 On public holidays and at weekends, the hot springs are popular with Thai locals, meaning that you will not be alone in the water. Sai Ngam Hot springs, (the background image) are also known as the 'secret' hot springs, but they have become less secret since they were placed on a local tourist map. 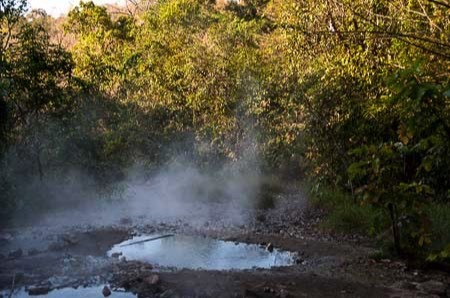 However – if you would like an adventure and to visit an idyllic spot to bathe – the springs are in the middle of the jungle. They are also in the Huai Nam Dang National Park, but the entrance fee is only THB 20 per person. The water is a pleasant 34°C and crystal clear.